Funky Desk | the convergence of how we interact with computers at home and at work. For my Sirius Madness 2018 Presentation. The above is the slide deck presented. Posted in Madness Sessions, SQL. Attached is my slide deck from my presentation at Sirius Madness 2017 in Charlotte. I will be adding a video with a talk track to accompany is soon. Quick post to point out an excellent article over at the Unidesk support site that doesn’t quite describe all the symptoms you may encounter. With Unidesk 2.7+ (2.9.4 in my case), if you are capturing Windows 10 build 1511 or greater, after you have captured your OS layer and deploy your first desktop based on that, you may encounter an endlessly spinning Win 10 boot screen. Unidesks’ article (found here), talks about the larger picture with how they capture images and provides an easy fix. It’s a pretty interesting peek under the covers of what they are doing during image capture. It is a far more predictive process around the storage side of things than I would have thought. App virtualization has changed so much in the last decade. Unidesk helpfully points out how you can positively identify this issue in the C:\Windows\inf\setupapi.dev.log file, but I wanted to hopefully associate more Google searches with this excellent fix (it takes about 10 minutes to implement), because while they detailed some scenarios you might run into, this common situation, capturing Windows 10, is not very advertised. If after capturing a new Windows 10 image in Unidesk and deploying a new desktop from the clean gold image, you find yourself staring at an ever more hypnotic spinning circle, follow the steps in the link! Posted in Unidesk, VDI, Windows 10. I had the pleasure of hosting a session at Sirius Madness this year in Charlotte with one of my co-workers, Tay Devkota. Our session covered what factors you should be looking at to maximize performance of large VMs. Attached is the slide deck we presented. Tony Pittman and I did our “Virtualizing SQL” breakout session at Varrow Madness 2014. Below is the slide deck we used. Randomly seen “Unable to launch application. Contact your help desk with the following information: Cannot connect to the Citrix XenApp server.SSL Error 43: The proxy denied access to …. port 1494” when using 2 or more PVS based STA servers, running on the same image. So this is one of those annoying error messages that can mean a great many things. You could actually have some firewall issues with the XenApp server you are trying to hit. However in a recent case, all of those factors were fine, and the problem would appear randomly. Usually if any of the above issues are present, it is an all or nothing game. It is either totally broke every time or it works. However in my case it would randomly work. You click on your app in web interface, and if you got the above message and retried a few times it would connect fine. Other times it would connect with no message at all. 2xXenApp 6.5 HRUP1 servers providing zone data collection for the farm and STA service. 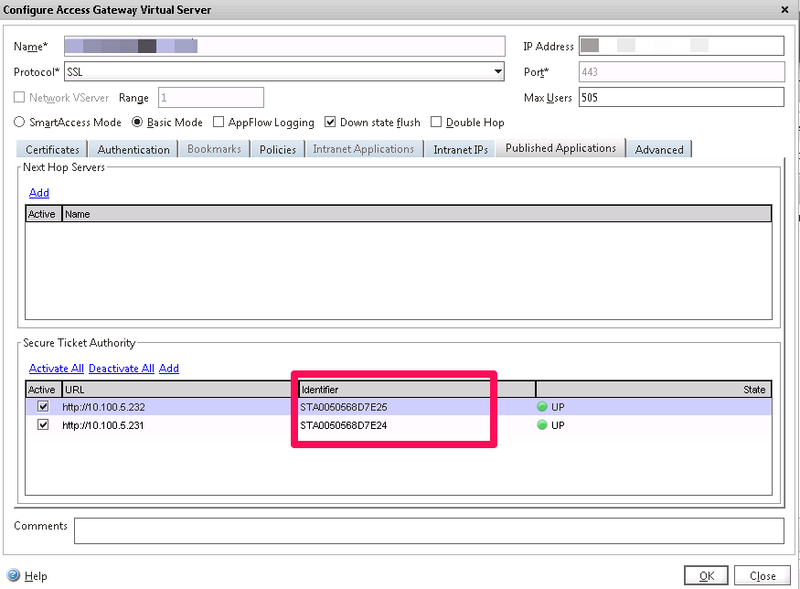 KEY POINT : Both STA servers are provided off the same PVS vDisk. Now it is important to note this pic is from AFTER I fixed the issue. When the issue was occurring, both STA Identifiers were identical. Essentially Citrix was expecting the identifier to be unique and was getting confused when both STA servers were responding to the same identifier. The relevant (and fairly new) Citrix Limited Release KB article is here. The hotfix side of the KB corrects an issue with using the XenApp Server Configuration tool, when you prepare a server for imaging and provisioning. It was not guaranteeing that each server had a unique STA. The second part of the fix is just to set the Citrix XML service to delayed start to ensure it comes up after the NIC does. So a simple fix for an odd and random problem.